"Tabbie has a lot of role models, but I think she has a new favorite," Tammy Major said. 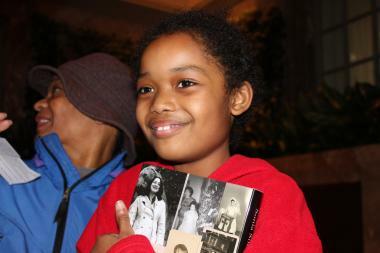 SOUTH LOOP — You'd think there was a rock star coming to the Harold Washington Library Wednesday afternoon, as crowds lined up hours before the guest of honor was set to take the stage. More than 750 people gathered in the library's winter garden to hear Supreme Court Justice Sonia Sotomayor read excerpts from her new memoir, "My Beloved World," with a packed overflow room screening the event to attendees who were too late to get free tickets. Monica Fohrman had a reserved seat along with other donors to the Chicago Public Library, but said she was told people lined up "as early as 10:30 a.m."
"The doorways were just packed with lines of people" when she stopped by at 3 p.m., Fohrman said. "People really want to see her." 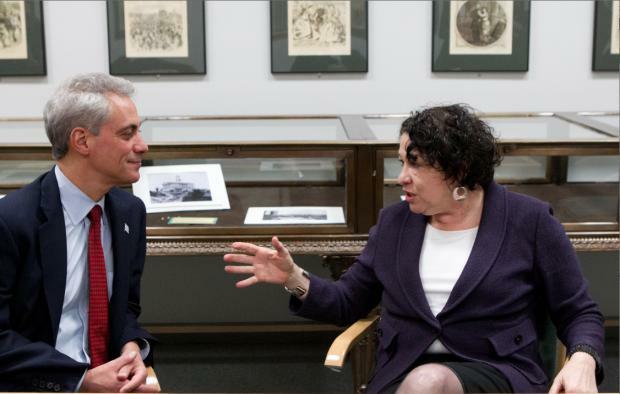 Mayor Rahm Emanuel echoed that sentiment in introducing the high court's first Hispanic justice. "I don't know of another justice that would get this type of turnout," he said, before recounting memories from his time in the Oval Office when Sotomayor was confirmed. Sotomayor's story has had a profound impact on Americans. Raised in housing projects in the Bronx by her parents, both Puerto Rican immigrants, and losing her father to complications of alcoholism when she was only nine, Sotomayor overcame numerous obstacles to attend Princeton University, Yale Law School and ultimately become a judge. Sotomayor was nominated to replace Justice David Souter by President Barack Obama shortly after Obama's first election and she was confirmed in early August 2009. Christine Arroyo, 60, from the South Side of Chicago, and a friend, were among those waiting in line around 3 p.m. to see the justice. "We were really impressed by her—she's Hispanic, her career and what she's done," Arroyo said. Sotomayor's life and her career have inspired many adults. On Wednesday she earned a new fan: seven-year-old Tabbie Major, who was the youngest audience member to ask the justice a question. Tabbie, who lives in Austin and is homeschooled in English and Spanish by her mother Tammy Major, spends hours each week in the library. When the library began soliciting questions to be asked of the justice, Tabbie wanted to know what books Sotomayor most enjoyed when she was seven. "Nancy Drew!" Sotomayor squealed at the reading, after insisting that Tabbie come hug her while she mingled with the crowd. Tabbie was starstruck after the event, saying that she might add "Supreme Court Justice" to the list of her dream careers — right behind "animal trainer."